Whirlpool Stove, Range, and Oven error codes list. Error codes appear on your Whirlpool oven’s display to let you know there is a problem. This complete list of Whirlpool oven fault code definitions will assist you in finding the issue. Use the codes below to clear, check, troubleshoot, and repair your oven. Once you understand the error code displayed, you will know which part of the oven is faulty and causing the error. 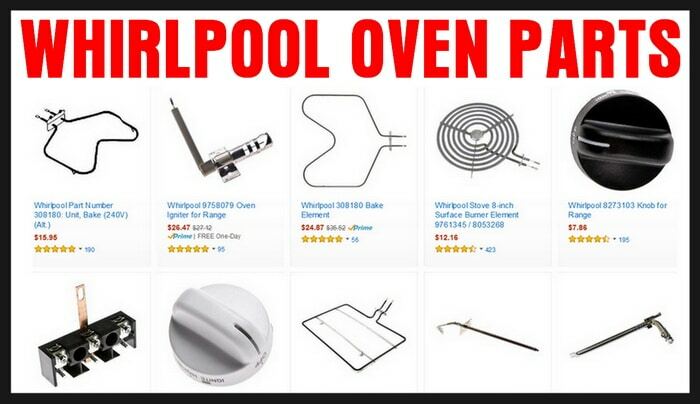 You can then purchase the part and fix the oven yourself. There are 3 letter error codes, 2 digit error codes, and 4 digit error codes on Whirlpool ovens. This means your Whirlpool oven will show either only 2 digits or two sets of 2 digits with a letter and a number. Example of 4 digit error code = e2 f3. Check/Troubleshoot = Press and hold the ‘Start’ or ‘Cancel’ button for ten seconds to remove LOC from display. If start is not pressed within 1 minute after pressing the keypad then the function is canceled and time is displayed. -Turn OFF circuit breaker to oven for one minute. -Turn ON circuit breaker to oven. -Check the oven for one minute to be sure the error code is cleared. Check/Troubleshoot = Unplug the oven power cord or turn OFF the circuit breaker. Reconnect keypad wiring harness. Plug the oven power cord back in or turn ON circuit breaker. Press CANCEL on the display. If fault code comes back after 1 minute then replace the keypad. 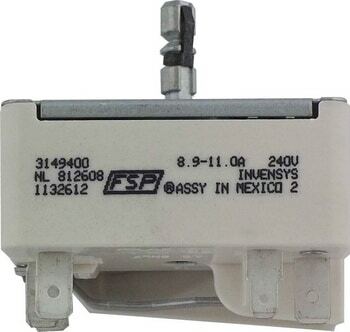 If F2 E0 persists then replace the electronic oven control. Check/Troubleshoot = Unplug the oven power cord or turn OFF the circuit breaker. Reconnect keypad wiring harness. Plug the oven power cord back in or turn ON circuit breaker. Press CANCEL on the display. If fault code comes back after 1 minute then replace the keypad. If F2 E5 persists then replace the electronic oven control. Check/Troubleshoot = Unplug the oven power cord or turn OFF the circuit breaker. Reconnect keypad wiring harness. Plug the oven power cord back in or turn ON circuit breaker. Press CANCEL on the display. If fault code comes back after 1 minute then replace the keypad. If F2 E6 persists then replace the electronic oven control. Check/Troubleshoot = Unplug the oven power cord or turn OFF the circuit breaker. Reconnect the oven temperature sensor wiring harness. Replace the wire harness if shorted. Use an ohm meter and check the oven temp sensor resistance. If resistance is not 1080 ohms at room temp then replace the oven temperature sensor. 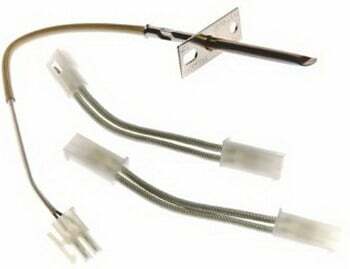 If oven temp sensor resistance checks good then replace the electronic oven control. Check/Troubleshoot = Unplug the oven power cord or turn OFF the circuit breaker. Reconnect the oven temperature sensor wire. Replace the wire harness if shorted. Measure the oven temp sensor resistance using a volt/ohm meter. If resistance is not 1080 ohms at room temp then replace the oven temperature sensor. If the oven temperature sensor resistance and wire harness connections a check good then replace the electronic oven control. Check/Troubleshoot = Unplug the oven power cord or turn OFF the circuit breaker. Use a volt/ohm meter and measure the resistance of the meat probe. If resistance is not 59000 ohms at room temp then replace the meat probe. If resistance of meat probe checks good then insert the meat probe and check for a secure connection with probe and jack. If jack is worn then replace. Check that the wire harness on the meat probe jack is not loose. Replace the wire harness if needed. Check/Troubleshoot = Test the oven door switch by opening and closing the door. See if the oven light turns on and off. 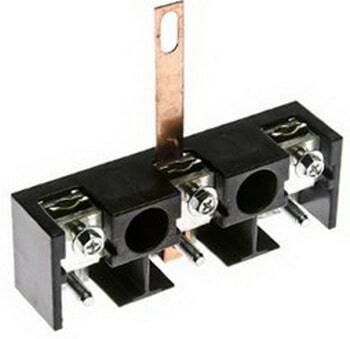 If the oven door switch is faulty then replace it. Unplug the oven power cord or turn OFF the circuit breaker. 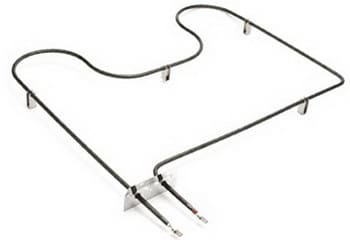 Connect any loose wire harnesses on the oven door lock assembly. Replace the wire harness if needed. Check the door lock assembly for faults and replace it if faulty. Check/Troubleshoot = Unplug the oven power cord or turn OFF the circuit breaker. Reconnect loose wires on the oven door lock assembly wire harness. Replace wire harness if needed. Check the door lock assembly for faults and replace it if faulty. In association with replacement parts due to error codes. 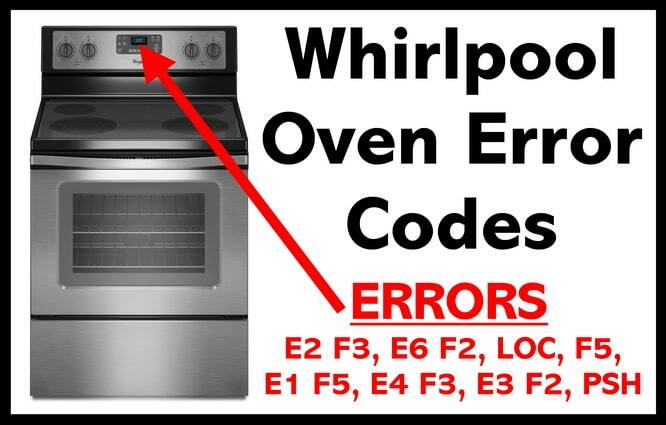 Need help repairing or troubleshooting an error code on your Whirlpool Oven, Range, or Stove? Leave your question below and we will be happy to assist you in fixing the problem. I have a Whirlpool self-cleaning accubake system with an error of e1 f7. Does anyone know what that means? It also beeps twice every time it comes on. Whirlpool oven will not lock for cleaning, What to do? My 6 sense whirlpool says that i have to close the door. the door is closed. That to do? I have whirlpool oven super capacity 465. Error code E1 F5. Can you help? I have an gold series oven. we turn on the oven cleaning system and at the end its cycle an error code f5e4 came up. plus the bottom of the oven is all hair line/ spider web cracks plus its buckled up at one end?. this cant be normal? please advise. thank you I have picture’s of the error code and cracks. I have the exact same problem. I also have the cracks and actual chippinig of the enamel oven surface on the floor of the oven at the oven door opening. Have you ever gotten a response or solution to this issue. I want to clean my oven today, but I don’t want to make the chipping/cracking worse. Thank you. Have error code 5 A6 or 5 Ab. How to I reset? I have error code 5 coming up on my ikea whirlpool nutid mwc 6 microwave oven,any help on what this is,if its one of the boards need replacing which one.It only happens when I switch the micro wave on,regards simon. Have a code of FE90. What does this mean? 5a6 6ath or 5ab bath. Does anyone know what this means and how to correct/fix this? Have a whirlpool oven model# Rf111pxsq. Replace both broil element and bottom element. Turn oven on and oven heating light blinks once but no heat. Can someone tell me what’s wrong with it. And top burners work fine. My Whirlpool Range keeps showing an error code F1-E2 on the clock display and I have tried breaking the circuit and it has returned…What does this mean ? The oven and stovetop still are working perfectly ! Any other suggestions ? I cannot afford a new part and wonder if this is just something I can ignore ! I was baking and everything was fine. Then the oven beeped and said there was an error– to press start and then cancel. Now I can’t turn on any of the oven settings. I get a message that says feature not available. After a thunderstorm, our range display shows the word “hot” and will not do anything. The burners work but the oven light comes on but will not stay on, and all other buttons just beep when pushed. Is this fixable or did the lightening permanently damage the stove? Range Model# WFE710H0AH0 Oven would not heat over 280 degrees after 30 minutes, Auto Test read – F1 E0, I replaced the control unit #WPW10340304 from Appliance Pro, Oven still not heating past 200 degrees. Auto Test with new Control Unit now says: “1 Failure…. 0 Fault…. Check wiring DBL K1 or BAK K2 or Bake Element. What should I do, return new control unit and order the lower oven bake element? My whirlpool oven has stopped working and on the display it reads f of, I can’t find anything on internet to say what it means? My oven keeps saying “hot” when i try to bake stuff but its not hot. Is that an error code and how do I fix it? After an overnight power failure, awoke to Whirlpool oven clock 20 minutes FAST. Attempted to correct clock and it produced 5A6 error code. After turning off breaker for 10 minutes, panel displayed 30 for a few seconds then returned to 5A6. Appliance is Whirlpool slide-in oven about 5 years old. I put a meatloaf in the oven when suddenly the door locked, error code e2 f 3 appeared and then it said “self clean” so I hit cancel and “cool” came on. We shut off the power but after an hour the door still wouldn’t open. My meatloaf is still in the oven and I can’t get it out. We don’t dare turn the power back on as it stays locked and starts heating up again! What can I do? Have a Whirlpool range model# wee740hoso with error code F8EO. The fan is turning too slow. What do I do to fix this problem? I’ve turned it off for 5 mins and code clears but as soon as I try to use the oven it returns. Both of the oven bake elements are missing in my wall double-oven, will this cause an error code of E6 F2 on the display panel? I started the self clean option on my Whirlpool range (about 8yrs old). I went back later to find the door ajar, and the lock out, but not engaged in the door. I have the E0 F5 error. Is there any way to clear this and disengage the lock. Previous post: LG Washing Machine IE Error Code – What To Check? – How To Clear? Next post: How Many BTUs Will You Need To Cool A Room With An AC?